Social Ride on Saturday, 17th November at 10 a.m.
Meet outside Unicorn P.H. on Holmes Chapel Road for a 15 mile ride to a favourite café for a drink / eat / chat then return on different lanes – at the pace of the slowest rider. All cyclists welcome. Our Chairman, Bob Norton reports: “A snippet about John Broadbent. Last month (Oct 22nd), he competed for GB in his age category, 65 – 69 years, in the World Triathlon Championships in Auckland NZ. He finished best Brit of 7 competing and was 7th out of 30 in his age category. The event was a sprint distance triathlon which involved a 750 metre swim (in the sea), a 20 km bike ride (which was not flat) and a 5 km run. John attributed his performance on the bike in part to riding with Congleton C.C. in 2012.” Well Done, John! This is the only event when age groupers meet each year and they have a 5 year age band from 15 -20, up to 80-85 (presumably it can go further if required). I am in the 65-69 group and took part in the sprint event which involved a 750 metre sea swim, 20 Km bike ride ( approximately of it was hilly and technical whilst the second part was a flat run back to the transition) and then a 5Km run through the harbour area. There were teams in my age range from Australia, Canada, New Zealand , USA, Germany as well as 7 people from Great Britain. Total number of entries in my age group was 30. Overall I managed to come 7th in the World and I was the first Britain home in my age group. This result qualifies for next years’ World Championship which is being held in London. I did the Congleton Time Trials in the summer and the Sunday Social rides and they both helped me in different ways, so thanks to anybody who helped me with those. Pete Smith reports: “Fantastic autumnal weather, with the temperature nudging 15c made for great conditions for our first night time chain gang. In total six club members set off from the Rugby Club at 6:45pm to ride the 11 miles to our ‘circuit’. The riders were myself, Mike Line, Mike Jones, Ed Wright, Les Hughes and Sheldon Starkey. Lymedale Business Park just off the A34 in Newcastle had been sourced for quiet, street lit roads where we could ride laps safely in formation. All agreed it was a great little circuit, 1 1/4 mile round with a ‘shortcut’ which would prove useful when the pace quickened! On arrival at the circuit a short briefing took place regarding safety and associated techniques to ensure that our chain gang would go without problems, then we set off for a couple of slow laps to familiarise everyone with the route and to point out the potential dangers – a few sunken drain covers and possible truck ‘emergence’ points. We then set off for an hour of paced riding, agreeing to set a suitable pace to keep everyone together for the first 20-30 minutes. Once this was up we released the shackles and upped the pace. A couple of groups formed and the next 30 minutes were a little disjointed but we achieved our aim – a good workout where everyone had stretched themselves a little and raised their heart rates! I think you saw that there were 6 of us on the club run. Myself, Georgina, Pete Smith, Sue Blake, Tristan Roberts and Stephen Kane. We set off for the old Priest House in Audlem, but could not get in when we arrived so went on to Dagfields. 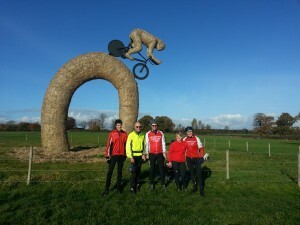 We rode out on some very muddy lanes passing thrugh Smallwood, Radway Green, Betley, Madfeley, Aston and Norton in Hales. We arrived at Dagfields in Hatherton somewhat mud splattered after about 35 miles. The return was somewhat cleaner as the sun came out and dried things up. On the way back we rode through Wybunbury, Weston, Englesea brook and Barthomley to Alsager and home for a round trip of about 55 miles. The club has been awarded £500 from the Cheshire East Communities Fund. This award is towards the cost of training coaches. Once we have trained coaches in place, we satisfy all the criteria necessary to obtain our Clubmark accreditation from British Cycling. Club Chairman Bob Norton said, “this will be a significant step in the development of the club, and will enable us to bring on the next generation of cyclists and help ensure the sustainability of the club”. Pete Smith has been unanimously endorsed by the club committee as our next candidate for training as a British Cycling Level 2 club coach. We also recently welcomed Charlie Evans as a member of the club. Charlie is an experienced cycling coach, works for British Cycling and brings valuable experience to the club. Together with Denise Hurst, who has already started Level 2 Club Coach training, this will bring our coaching members up to three. Tuesday Chaingang – Lymedale B.P. There were 6 riders out today. They were from L to R in the photo, Tristan Roberts, John Broadbent, Stephen Kane, Georgina and Bob Norton and Sue Blake (who took the photo). We left Congleton in bright but cool conditions, bound for Bunbury. We travelled out to Church Minshull then onward through Cholmondeston (pronounced Cholmonsdon or Chumley?) before calling in to Snugbury’s at Barbridge for a close up look at their fantastic straw sculpture of a track cyclist in full pursuit mode. The sculpture is 30 feet tall and the cyclist is 8 feet tall. We continued to Bunbury via Acton and Haughton. There we stopped for beans at Tilleys. The return was via Tilstone Bank, Eaton, Little Budworth, then onto the Whitegate Way to Winsford, before returning to Congleton on the outward route which was rejoined at Occlestone Green. The distance for the day was 63 miles Congleton to Congleton although everyone rode out to the start and then home again. Sue Blake could claim the honours for most miles with 73 mikes (from Gawsworth). Revolution Track Meeting at the Manchester Velodrome – first of this Winter’s series – with many Olympic stars, plus “Future Stars” (boys and girls) which always provides exciting competition. MDTTA Committee Meeting. VTTA (Mcr & NW Group) AGM.